Abstract: Airwheel Q5 electric unicycle is not only an excellent alternative transport, but also healthy fitness equipment. People, when riding Airwheel Q5 electric unicycle, can not only get rid of the trouble of congestion, but also get a workout. Traffic jam is a common and usual phenomenon in a city, which city dwellers have more or less gone through before. It might take ten or more minutes for a traffic jam to mitigate with any luck, or one may spend tens of minutes, several hours or even longer before he/she gets to the destination. 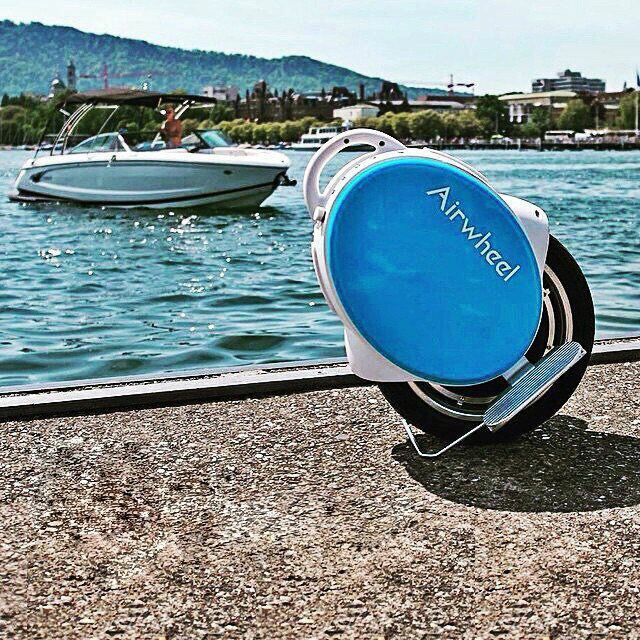 Airwheel Q5 electric unicycle is a useful and helpful alternative transport. It is an optimal choice for people living in cities and intending to be free from the problem of traffic jam. What features does an Airwheel Q5 electric unicycle possess as an alternative transport? And what kind of unusual experience on earth can riders enjoy in travelling? Next, we will present detailed information as possible on Airwheel Q5 electric unicycle. As a one-wheeled scooter, Airwheel Q5 electric unicycle has to be good at balancing. In order to achieve better balance of the bodywork, Airwheel Q5 electric unicycle employs the currently state-of-the-art self-balancing system and adheres to the principle of dynamic homeostasis in design, presenting an improvement both in technology and design. In addition to strong stability, Airwheel Q5 electric unicycle also does well in battery performance. It adopts an imported original SONY battery, which can not only be charged repeatedly and circularly, but also boasts service time and life several times of common batteries. The stronger its electric power storage capacity is, the farther it can travel. Airwheel Q5 electric unicycle is a light and convenient self-balancing scooter that can carries people. It can be used as both a means of transportation and a fitness tool. Airwheel Q5 electric unicycle has won great popularity among a large number of students since it is full of fun and convenience. Airwheel Q5 electric unicycle is a high-tech intelligent scooter with multiple functions, such as transportation, sports and intelligence promotion. Those unremittingly riding a Airwheel Q5 electric unicycle for a long time can get their cerebellum exercised so as to improve their balance ability and nerve reacting ability. Young people may use it to travel, which can save time and avoid traffic jam; the old may use it to do exercises and strengthen their physique; while kids may use it to have fun and promote brain development. Airwheel Q5 electric unicycle provides different riding experiences for different groups.